Layers are a powerful feature in TwistedBrush Pro Studio. Layers allow you to work on elements of your image without impacting other areas. In this scene the background is on a separate layer as are the fish and the shells. This makes it possible to edit those elements independent from the others. TwistedBrush Pro Studio allows for up to 255 layers in your images. The Layers Mini bar is a quick and easy way to do most layer actions. The Layers panel is the full layer control panel. The Layer panel can be accessed from here. 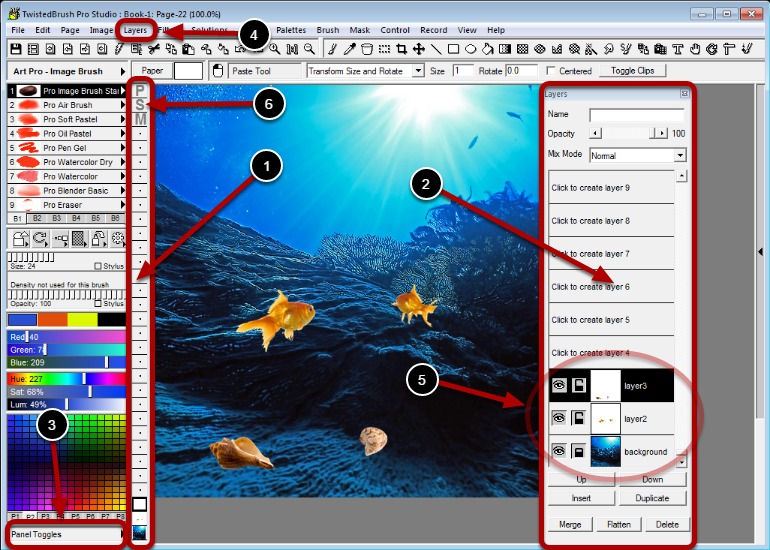 The Layers menu allows for additional controls and actions you may want to perform on layers,. Here you can see the background screen is on a separate layer from the fish and shells. Within the Layer Mini bar are icons for 3 special layers. See the Special Layers section of this manual for more details.